The Rain Came Down … Sometimes when it rains, it pours. Negative attitudes and reactions can cause a chain-reaction. Eventually the storm will end the sun will shine again. No, David! … Sometimes kids feel like they are always doing something wrong and getting yelled at. Does that mean that their parents don’t love them? David Gets in Trouble … Learning about taking responsibility for one’s actions and apologizing. David Goes to School … Great for discussing basic rules at school. How I Became a Pirate (by Melinda Long, illustrated by David Shannon) … Wonderful story of amazing imagination, but also briefly touches on the great things about being a kid and being part of a family. Pirates Don’t Change Diapers (by Melinda Long, illustrated by David Shannon) … A fun way to talk about adjusting to a new baby in the house. 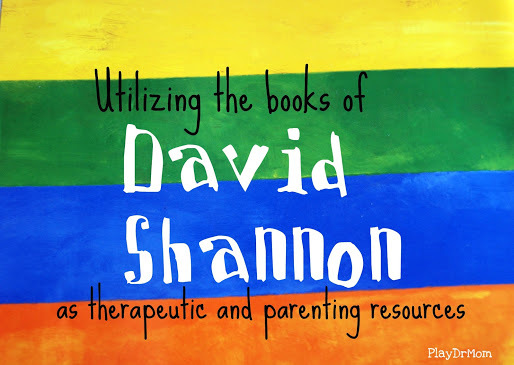 Do you have any suggestions of David Shannon books to use as a therapeutic or parenting resource? I’d love to hear them! Please leave me a comment! Thank you so much for always sharing how books can be used in a variety of way to teach our child life lessons. Sometimes it’s so much easier to open up with a book.